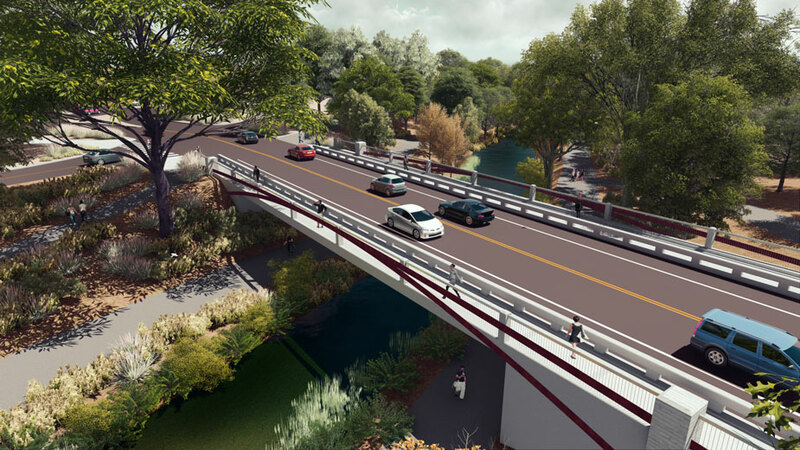 Artist’s rendering of the new bridge, looking north from the roundabout on Old Davis Road. Arboretum Way, lower right, leads in and out of the parking lot behind the Mondavi Center administration building. Updated March 13: In a change of plan, only cars and bikes will be able to use the La Rue Road crossing during construction — pedestrians must use detours. This story has been edited to reflect this change. See map of pedestrian detours here. Another big road construction project is about to begin in the south campus: replacing the La Rue Road bridge over the Arboretum Waterway. 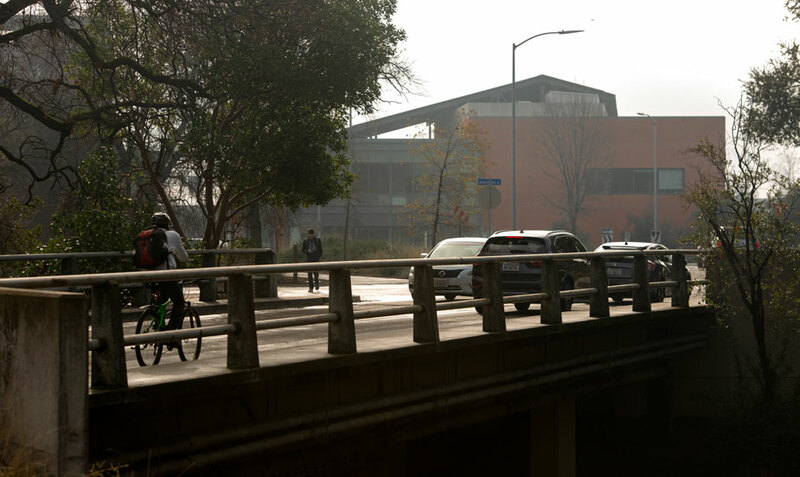 The bridge just north of the roundabout on Old Davis Road is integral to the movement of cars, bicyclists and pedestrians between the north and south campus. Pedestrians will need to take detours throughout the 14-month-long project, but cars and bikes will still be able to cross the waterway in both directions as the contractor builds the new, wider bridge one side at a time. With the old span out of the way, the contractor will build the east half of the bridge. When it all comes together, we will have a 52-foot wide bridge with two 12-foot-wide traffic lanes, 8-foot-wide bike lanes and 6-foot-wide sidewalks, and barriers between the bike lanes and sidewalks. Compare that to today’s 32-foot-wide span with narrow sidewalks and no bike lanes, built in 1950. The campus has grown significantly since then: more students, more buildings and more north-south traffic, especially considering all the new development in the south campus, including the Mondavi Center for the Performing Arts, the Robert Mondavi Institute for Wine and Food Science, and the Jan Shrem and Maria Manetti Shrem Museum of Art. Accompanying this growth that has turned the south campus into UC Davis’ front door, the university built the roundabout on Old Davis Road in 2011 and rerouted Old Davis Road between the campus and downtown Davis in 2012. The “old” Old Davis Road east of Mrak Hall Drive is now part of Arboretum Drive along the waterway; the new route swings around the Hyatt Place hotel and the back side of the Wyatt Pavilion, connecting to First Street. Cars will be able to cross the waterway at all times during construction. But as with all projects like this, you should expect delays. Bicyclists, as always, may use the traffic lanes. Or, bicyclists can divert to other waterway bridges to the north and south. Pedestrians must use other crossings. Arboretum paths under and near the bridge will be closed. Detours will be posted. See map of path closures and detours. Gordon N. Ball Inc. of Alamo, Contra Costa County, won the La Rue Road bridge contract with a low bid of $7.6 million. Work is expected to start later this month and continue until the spring of 2020. Kurt Wenger, senior project manager with Design and Construction Management, gave the total project cost (including engineering and project management) at $12.7 million. UC Davis is paying about $2 million, and the Federal Highway Administration, through the state Department of Transportation, or Caltrans, is paying the rest. For this the campus is not only getting a new, wider bridge but one that will be seismically sound, supported by piers to be drilled 80 feet into the earth. In addition, whereas the existing bridge is posted for maximum weight of 7 tons, the new bridge will not be posted at all — in that it meets today's design standards for expected vehicle weights. The first order of business: damming the waterway on both sides of the bridge and installing a pipeline to allow continued flow. The Arboretum Waterway steward will monitor and manage wildlife throughout construction. The contractor will put in new irrigation systems in the area, and staff and volunteers of the Arboretum and Public Garden will take care of replanting. The bridge serves more than traffic. On the sides of the span and underneath it, the campus and Pacific Gas and Electric Co. have attached nearly three dozen conduits and pipes carrying electric and communication wires, natural gas and compressed natural gas. As part of the bridge replacement project, many of those lines will be rerouted under the Arboretum Waterway. The paths next to the waterway will be lowered, so no one will be forced to duck when walking under the bridge. Two of the access paths will be replaced with stairs, and the other two will be regraded to meet accessibility standards. See the arch embellishment on the artist’s rendering above? That’s the work of Christina De Martini Reyes, campus landscape architect. Read more about her thought process and see another rendering. The bridge being replaced dates back to 1950, nine years before the Board of Regents declared UC Davis a general campus of the university. UC Berkeley designed the bridge, which originally was part of California Avenue. At the time, California Avenue cut clear across the campus. By 1969, however, a map of the growing Davis campus showed California Avenue cut in half — after the campus devoted a large section of the road’s southern right of way to science buildings between Hutchison Drive and the waterway. The Roessler lecture hall, which opened in 1971, sits practically on top of the old road. La Rue Road took California Avenue’s place as the north-south route across campus, although the name “California Avenue” stayed in place on the southernmost section of road that includes the bridge. Then, in 2013, the campus substituted “La Rue Road” for this section of “California Avenue,” eliminating the confusion that arose when giving directions. Today, you can simply say La Rue runs all the way between Old Davis Road and Russell Boulevard.